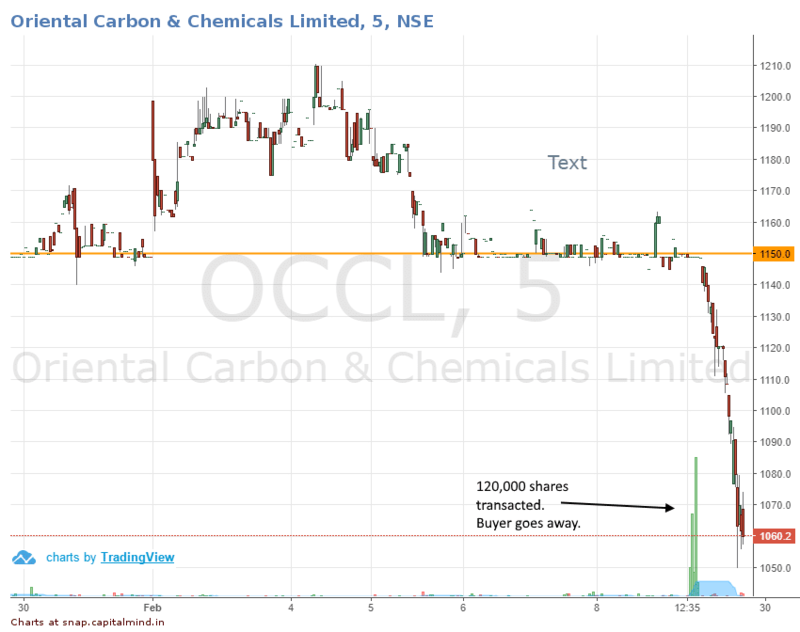 Oriental Carbon and Chemicals recently announced a buyback – a very tiny one, at Rs. 35 crore, at a maximum of Rs. 1150 per share. The buyback was through the stock market rather than a tender offer. Having started in November, the price of the stock was about Rs. 1080 or so and headed quickly towards the 1150 mark, because hey, the company was buying back at that rate. Over the last two+ months, they managed to buy back about 180,000 shares till Friday the 8th of Feb. The average volumes of this stock are a ludicrously tiny 4,000 shares a day, and typically a good portion of the volume has been because the buyer is, well, the company itself. And then, today, someone hit the stock with a massive 120,000 share order, and in a few minutes the big buyer was gone. The 120,000 shares meant that the buyback was over. The company cannot buy back more shares, because they have the upper limit of R.s 35 cr. on the buyback. When your big buyer is gone, then even a tiny amount of shares sold will send the shares into a selling tizzy. Which means, for OCCL, the stock fell 8% in the remaining two hours. Illiquidity can be your friend if there’s only strong buyers – we saw that in 2017. But now, literally every stock has strong sellers – and if it takes 120,000 shares (about 12 crores) to wipe out a buyer, then you can bet someone will try to wipe him out. In times like now, when there is more selling interest than buying interest, every stock is vulnerable. Hey, even Zee fell 30% on about 400 cr. of volume, and for a Nifty stock that isn’t too much, you would think. In fact, many “operated” stocks are now in trouble – because, with increased focus on mutual fund lending to promoters (some of whom use the liquidity for operators to maintain prices) there is a drop in liquidity available to “manage” stock prices, and therefore, the big buyer – in this case, the operator – is out of action. This is a feature, not a bug, of a better capital market – when the shady liquidity goes out, the proper liquidity (read: really interested buyers and sellers) will come in, but in between, we will have issues like an 8% drop for no real reason. 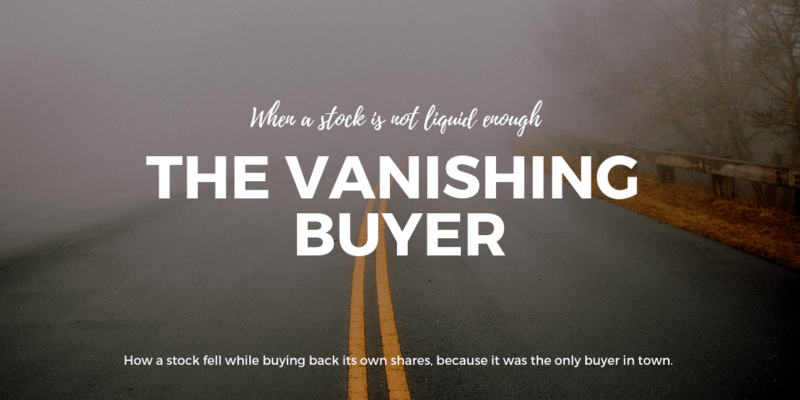 Note, however, that buybacks are not shady – this particular stock (OCCL) just happens to be quite illiquid, and the company’s buyback amount was just too much in relation to regularly traded volumes. Still, it shows you what happens when one party to a regular trade simply vanishes.